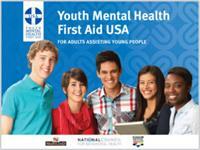 Reliance Health is now offering Youth Mental Health First Aid. Youth Mental Health First Aid is designed to teach parents, family members, caregivers, teachers, school staff, peers, neighbors, health and human services workers, and other caring citizens how to help an adolescent (age 12-18) who is experiencing a mental health or addictions challenge or is in crisis.The course introduces common mental health challenges for youth, reviews typical adolescent development, and teaches a 5-step action plan for how to help young people in both crisis and non-crisis situations. This training is being offered on Monday, September 24th from 9am - 5pm at Courtyard Marriott in Norwich for $80. Register at: https://www.eventbrite.com/edit?eid=48283441072. Discounts available for group registration. Contact Nicole Reynolds for discount code at (860) 887-6536 ext. 275 or to discuss oppurtunities to schedule this training with your staff.